The Morning Star is the only socialist English language daily newspaper in the world. Founded by the Communist Party in 1930 as the Daily Worker, it played an outstanding role in the fight against fascism. After the Second World War, in maintaining and extending the breadth of the paper's base, the Communist Party transferred ownership of the Daily Worker to a co-operative, the People's Press Printing Society (PPPS), which owns and manages the paper to this day. Individuals and labour movement organisations can take out shares in the PPPS - and many have done - but each shareholder only gets one vote, no matter what the value of their holding. The fact that the paper is still publishing after all these years reflects the enormous dedication and commitment of its staff and its many supporters. It aims to be the "daily paper of the left" and carries regular articles by a number of labour movement personalities. Although the Communist Party does not own the paper, and certainly does not dictate terms to it, the relationship between the Party and the Morning Star is one of close comradeship: the objectives are the same, the editorial is written in line with the strategic objectives of the Party's programme, Britain's Road to Socialism, and the Party sees building support for the Morning Star as its number 1 priority. 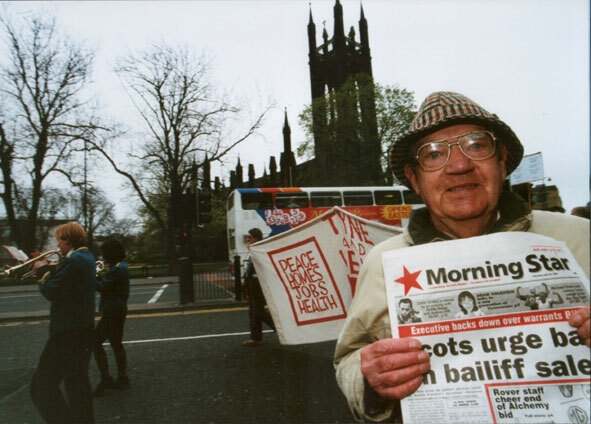 The Communist Party therefore works closely with the Morning Star to build daily sales of the paper, to extend its influence, and to win donations to the Peoples Press Fighting Fund, which helps keep the paper going. Our members are active in Morning Star Readers' and Supporters' Groups, particularly on Tyneside and in Eden Valley & Kendal. We co-operate with other supporters of the paper in distributing 2000 free copies - courtesy of the Durham NUM - at the Durham Miners' Gala in July each year. The Tyneside Readers' and Supporters' Group organises the annual Northern Regional Morning Star Conference, and a major fund-raiser in the annual Tyneside Morning Star Bazaar. The Morning Star appears daily, Monday to Saturday. An online subscription is available via the Morning Star's own web site, but it is critcally important for the paper's continued publication that its print run is extended, i.e. that printed copies are bought. Can you help by buying the Morning Star, selling it or even just passing it on so that more people see it?